For most people technology is cold. Just some cold, hard tools that you use to perform cold tasks. Creating endless tables with cold data, creating charts, writing reports, communicating with your employees through cold boxes that home all your business emails. However, and this is something successful technology brands know very well, technology can make you feel. Just like a really nice car seat in a really nice car going down the La Jolla Scenic Drive or really nice pair of shoes or a really nice watch, technology can make you feel good about yourself. It can make you feel functional, confident, full of opportunity. Think of yourself as the superhero and technology as your trusted sidekick. It helps you get the job done, gain people's confidence or even save the day. Technology today can help you create magic, so you need to stop looking at it as an inferior servant that occasionally brings you joy when playing a game of Mahjong during your afternoon break from stressful emails and data. It doesn't matter what you do for a living, every job gets stressful at some point. But, if you pick the right technology, you can create a better, more efficient, productive and less stressful business environment. Let's go back to the part where we feel better about ourselves – better working conditions make you feel like you truly accomplished something important. Here's the difficult part – balancing technology that makes you and your employees feel better about the work you are doing and making the costs fit your business budget. Besides, the world or computers and networks can be a truly confusing world for all other worlds. With billions of options on the market it is hard to keep track, yet alone make a choice that you won't regret. In our experience, most small businesses in San Diego don't have an in-house IT expert on staff, and such businesses need help navigating their way through the world of IT. And this is where an IT sales professional comes in. An IT sales expert will help you buy hardware, software and IT service. IT sales and IT consulting go hand in hand. As the matter of fact, consulting is an integral part of consulting. At the same time, sales are often bundled with installation services as well. What does this actually mean? 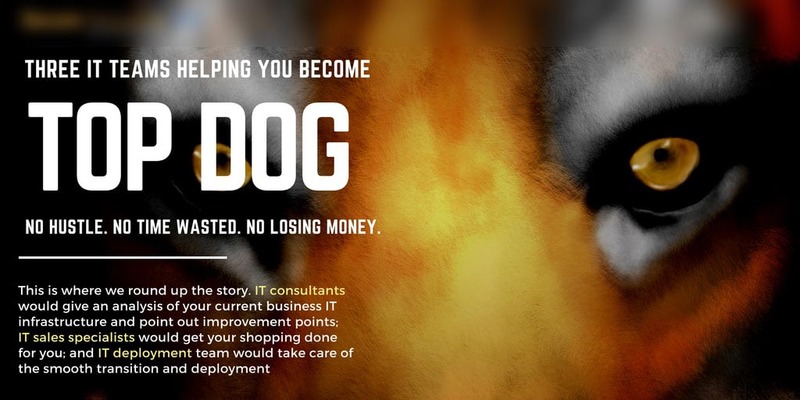 It means that in case you hire an IT company that has both IT sales and IT consulting experts on their team, you'd be able to get an analysis of your current business IT infrastructure – its strengths, weakness and what needs to be done to make it even stronger and more efficient, AND - you'd get your shopping done for you. And in case the same company provides IT deployment services you got yourself an IT team handling the whole confusing world of IT and delivering exactly what you need to your office door. No hustle. No time wasted. No losing money. And here's the awesome part – you don't need to go through endless Google search, because Secure Networks ITC has been harnessing technology all this time while you were focusing on growing your business. For more than 15 years we have been keeping up the pace with rapidly evolving world with technology in its core, acting like a high-speed bridge between our clients and contemporary technology. 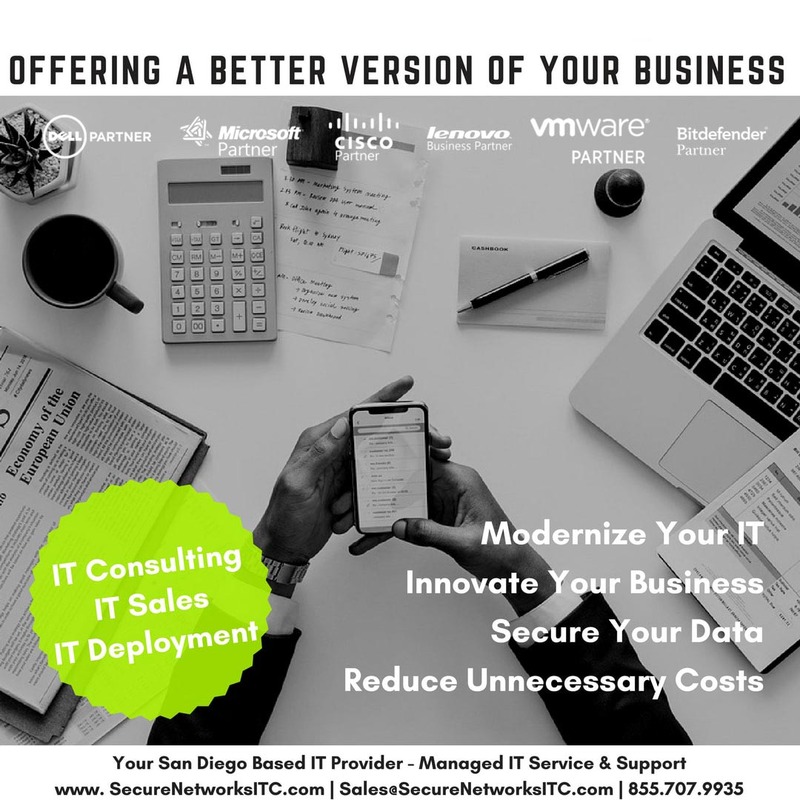 For us as the managed IT service providers , IT consultants and IT sales specialists, the most important goal is to help our clients feel good about their work, good about technology that is enabling them to become and remain San Diego industry top dogs. Now we come to determining what you need. Recommending the latest and greatest is a piece of cake – just buy the most expensive tech stuff and you'll get the greatest. However, getting the latest and the most expensive technology is something that most of us can't afford, and more importantly, in most cases, it's not really necessary. Especially if we're talking about structuring business IT environment. The true wisdom is getting the best possible components for the business that you own, for the money that you have. That's why we partnered up with industry leaders, such as Microsoft, Dell, Lenovo, Cisco, VMware and Bitdefender, to have technology finest and best possible solutions at hand whenever your organization's IT needs an upgrade. The second crucial benefit of our broad partnership is that we would be able to offer you necessary products at the best possible prices. Based on the conversation you or your representative has with our IT consultant, we'll come up with a few offers regarding hardware, software, network equipment, or an entire IT infrastructure if needed. One offer would be based on what we've determined to be an ideal solution for your business, and other options would be more affordable or not so much demanding variations of the ideal offer. Our vast experience enables us to pinpoint exactly what you need while working on reducing unnecessary costs. We would analyze your employee's activities and requirements and suggest some innovating solutions to enhance productivity and overall commutation. We would come up with the best possible specifications for different workstations based on the type of business, employee's rank and type of operations. We would pay special attention to your business security. Protecting business data is one of the main challenges businesses face in the current highly tech world. With so many malicious software out there, lurking and looking for a way into your company's files, appropriate antivirus and anti-ransomware strategies are one of our top priorities. Again, based on the size and type of your business, we would recommend appropriate hardware (servers, firewalls, etc. ), antimalware software, and a secure backup strategy. Next, you or your representative would go through these offers and let us know in case there are any additional technical questions that we would be happy to answer. You would be able to choose an option or request customization and we would advise you regarding the various possibilities. We would point out where you could cut more costs, what is absolutely essential and what you don't really need at that point.